At the age of 16, while employed as a $4 per week mechanic in a shop that produced compressed air machinery, Sanford Moss had the idea that if fuel could be burned in com­pressed air, the energy output would be increased tremen­dously. This idea, which was to make possible the alti­tudes, speed, and range of today's aircraft, came years before the Wright Brothers made their historic flight at Kitty Hawk. Moss took the idea with him to the University of Cali­fornia. By 1900 he had earned his Bachelor's and Master's degrees, and he went on to Cornell where, in 1903, he wrote his Ph.D. thesis on the gas turbine. The thesis attracted the interest of engineers at GE and got him a job at the West Lynn plant. Working with Charles Steinmetz and Elihu Thomson, Moss first concentrated on centrifugal compres­sors used in blast furnaces and then on steam turbine devel­opment. The experience he gained in these fields was rec­ognized during the first World War by the National Advisory Committee for Aeronautics, which asked him to find a way to give military planes more power. Moss's solution, worked out with the cooperation of the U.S. Air Corps, was the turbocharger - a unique turbine-type compressor. On June 19, 1918, Moss and his associates ascended Pikes Peak with a 350-horsepower Liberty engine in tow in order to test his turbosupercharger. The new device attached to the reciprocating engine was designed to boost power by compressing air into the intake, allowing the engine to "breathe" normally even in the thin air at 14,019 feet. The test was successful, and in 1921, a new world altitude record of 40,800 feet was established in a biplane equipped with the device. Interest in it extended even to the automobile racing circuits, where at least one Indianapolis 500 winning car was fitted with a Moss turbosupercharger. During most of the period between World War I and World War II, while at GE's Lynn Works, Moss also developed the geared supercharger using design principles that have since been followed on most radial-type airplane engines. Although 65 at the time, he returned to GE at the outbreak of World War II and went to work refining the turbosupercharger. When the United States entered the war, he became consultant to the Army Air Forces. Soon, the B-17 Flying Fortresses, the B-24 Liberators, the P-47 Thunderbolts, and, later, the B-29 Superfortresses, all equipped with turbosuperchargers, were flying higher, faster, and farther than planes had ever flown. As for the industrial gas turbine, it waited until after World War II when GE engineers combined metallurgical developments with new jet engine technologies to turn Moss's dream of some 40 years earlier into reality. Moss's technical contributions were also evident in areas outside of the hardware used in airplanes, automobiles and industrial equipment. He will be remembered for the militant enthusiasm and energy with which he advanced the standardization of symbols and terms used internationally in science and engineering. 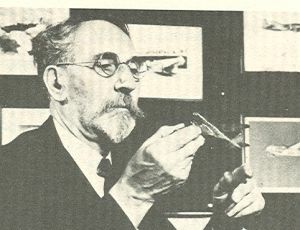 As a result of his pioneering efforts, Moss received the Collier Aviation Trophy in 1941, the Sylvanus Albert Reed Award of the Institute of the Aeronautical Sciences, the A.S.M.E. Holley Medal and the Howard N. Potts Medal of the Franklin Institute. Charles P. Steinmetz - pioneer of AC power systems, first person to understand AC power mathematically.